With years of experience in outdoor Team Building Activities and Events, UOA merge with European company Maestro, that has unique indoor exercises and games for corporate clients. Result is Team Academy - the right choice for your Team Building event. We will ignite your Team Spirit and help you to get ahead of your competition! Spirit is what makes a difference! Spirit is the defining characteristic of the high-performing teams, the trait that makes a team more than the sum of its members. It is the energy source capable to move your organization to a higher level of awareness, communication and effectiveness. Let our Team Building Wizards energize and inspire your team and you will enjoy exponential success, allowing you to get ahead of competition and stay there! As leaders in custom designed Corporate Team Building, we successfully ignite Team Spirit - the secret weapon that makes an organization more than just the sum of its members. Request Team Building Activity Quote. You can choose different zones for your event: Adrenaline, Fun, Mystery, Adventure, Creative, etc. and select from variety of activities that you prefer. The sky is the limit! It was the best team building event ever! "... I appreciated your professionalism, enthusiasm, and organization throughout the event. Your team surpassed my expectations (and I do have high expectations)! ..."
" ...UOA will be at the top of my list the next time I have the opportunity of doing another team building event. Jackie and her team are extremely passionate about their work and dedicated to their clients..."
Who? Teams focused on high performance & determined to succeed. From 8 to 300+ participants, ages 9 to 60+. What? 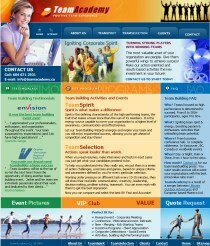 Igniting team spirit & energy, boosting passion & enthusiasm. Activities that unleashing team potential. Where? From luxurious conference hall, to complete wilderness. In Vancouver, British Columbia, Canada or worldwide events. When? Day or Night, Rain or Shine, from 1 hour to few days. How much? Contact us for our base teambuilding prices. You want results and we will exceed your expectations with the best price/value ratio ever! Tell us about your needs & objectives. The more we know - the better results. Designing activities and games, final adjustments and details. How can we improve and work better for your future team work success.